Archery can be a myriad of things. For some, it is a performance sport and a lifstyle choice. For others - a fun thing to do in the spare time. In any case, the important thing is to find yourself, to test your own physical and mental limits, and, most of all, to have fun and to relax. 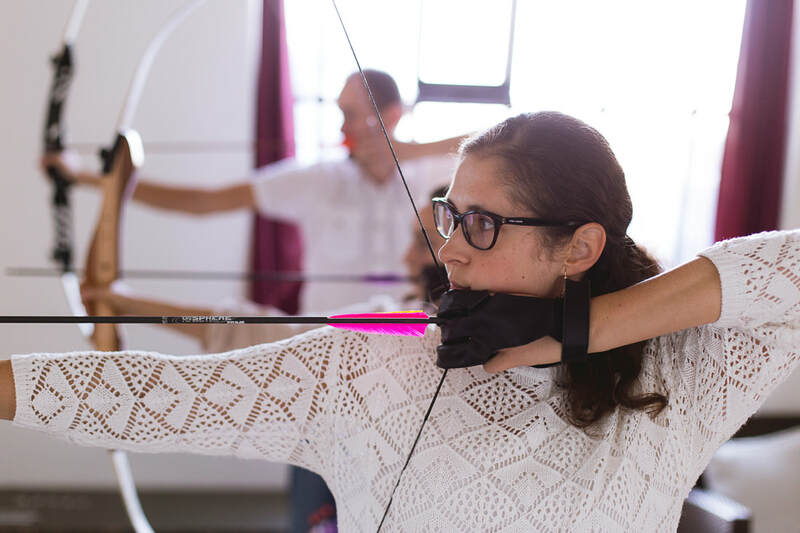 Arco Vienna Club is the perfect place, located in the centre of and above Vienna, where you can share our passion for archery or make your first steps into a new and exciting sport. Every new face is welcome to enrich our international community with a new story, perhaps even with a new language. If you have not visited before or you need basic training, click below. This booking is not binding. We will reply quickly to discuss a few things and arrange your training. If you are already a trained archer who is coming to Arco Vienna for the first time, we will need you to demonstrate your competence. Archery is relaxing, calm and appreciative. We find our focus and fun under the sounds of pleasant music. If you want to come and check it out yourself, please click the button on the top left of this page. In this way we know you want to come and can provide space, equipment and, if needed, an introductory training. Contact us for further details, we're more than happy to help. We shoot on four shooting lanes in a pleasant company, always under the supervision of an experienced trainer who provides advice, games and plenty of fun. Please be aware that we will stay closed on Friday 19th and Monday 22nd of April. We apologize for any inconvenience caused by this. Archery is surprisingly quick to learn and creates immediate gratification experiences. After a quick introduction during a 90 minutes "First time ever" course (50€, equipment included) with our qualified trainers, you will know the basic techniques and will be able to hit a target at 10 meters. You will feel your power and will learn how to apply it efficiently. The quality of our training is guaranteed by experienced trainers who are always excited to share their passion. You will learn a lot about bows and arrows and you will certainly learn a lot about yourself. Archery is a passion that will not leave you indifferent. You can find a whole lot of positive feedback about our Basic training on Facebook and Google+. The online newspaper Vienna.at has written a great piece about us, see the PDF file (in German only). On request, we can organise archery events, respectively evenings for groups of up to 10 people. 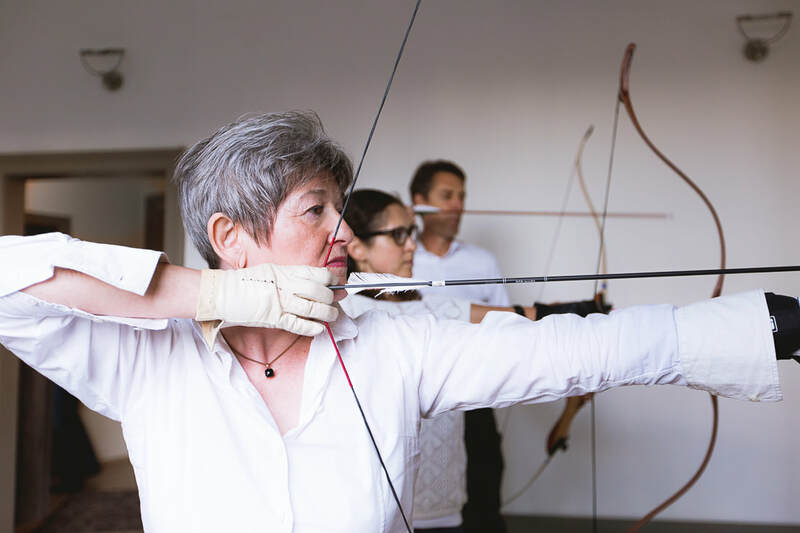 Coaching by several experienced trainers, a framework program and funny archery games are included. Depending on the size of the group, one event lasts 3-4 hours. We guarantee fun and relaxation! We are really good in inventing and setting worthy challenges. Regardless whether you need a relaxing meditative setting, send arrow after arrow in the bull's eye, or want to be trigger-happy and pierce loudly bursting balloons, fun and a good mood are always our top priority! We make an effort to teach you an easily reproducible and safe technique. That being said, we are no performance freaks. We are just easy-going people who love archery. And when we are really happy and we know it, then we shoot at moving targets on a swinging pendulum, organise duels or make an indoor 3D safari in our projected archery cinema.